Years after contracting the initial polio infection, increasing numbers of polio survivors in Australia have developed a range of symptoms, now recognised as post-polio sequelae. The time lag from the initial infection to this second phase varies but is commonly approximately 30 years. The onset is usually slow and steady. It may occasionally develop suddenly and progress at an irregular pace. Symptoms sometimes emerge after a period of physical or emotional strain, or after a period of immobility (for example, disease or surgery). The post-polio sequelae cause a range of debilitating health effects, and manifest primarily as biomechanical and neurological symptoms. The condition is referred to broadly as the Late Effects of Polio (LEoP) or, in circumstance where specific clinical diagnostic criteria are satisfied, as post-polio syndrome (PPS). Prior paralytic poliomyelitis with evidence of motor neuron loss, as confirmed by history of the acute paralytic illness, signs of residual weakness and atrophy of muscles on neurologic examination, and signs of denervation on electromyography (EMG). A period of partial or complete functional recovery after acute paralytic poliomyelitis, followed by an interval (usually 15 years or more) of stable neurologic function. Gradual or sudden onset of progressive and persistent new muscle weakness or abnormal muscle fatigability (decreased endurance), with or without generalized fatigue, muscle atrophy, or muscle and joint pain. (Sudden onset may follow a period of inactivity, or trauma or surgery.) Less commonly, symptoms attributed to PPS include new problems with breathing or swallowing. Symptoms persist for at least a year. Exclusion of other neurologic, medical and orthopaedic problems as causes of symptoms. Paralytic Polio vs Non-Paralytic Polio – What is the Distinction? The diagnostic distinction between “paralytic” and “non-paralytic” polio was entirely arbitrary during the epidemics of the last century. In fact, the category of non-paralytic polio contained many patients with mild or temporary paralysis and with encephalitis, which occurs in people reaching the later stages of this illness. 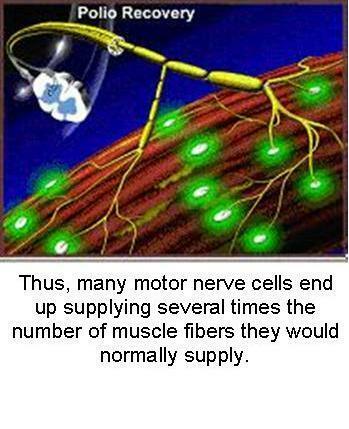 Modern studies indicate that overt paralysis in these people depends entirely on the percentage of spinal nerve cells destroyed. 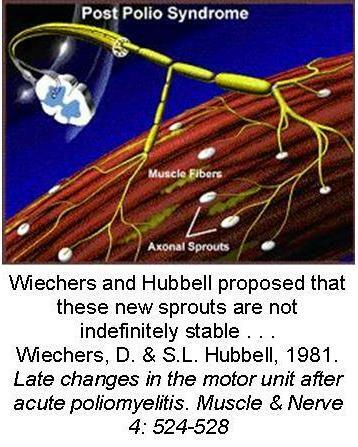 For damage to be visible as weakness or paralysis at least 50% to 60% of the nerves controlling muscular action must be damaged or destroyed. It should be absolutely understood that patients who were told that they had ‘non-paralytic’ polio did, in reality, have polio, which affected their anterior horn cells. Now, 30 to 40 years later, these patients are potentially subject to all of the vagaries and insults to the body that affect other persons with postpolio syndrome. Asserting that a history of paralytic polio is required for a history of PPS effectively, and incorrectly, says that no neurologic damage was done during acute nonparalytic polio. PPS must be considered in the differential diagnosis of individuals with unexplained fatigue and weakness … regardless of whether they report a prior history of paralytic polio. The broader condition known as the Late Effects of Polio takes in both PPS and a host of additional ‘bio-mechanical’ symptoms including: scoliosis; kyphosis; respiratory problems; dysphagia (swallowing difficulties); muscle contraction; head, neck and joint aches; chronic tendonitis; bursitis; nerve compression; osteoporosis; arthritis; and fatigue; many of which will impact on virtually every survivor of polio. These symptoms vary considerably in the polio community, both in range and severity. 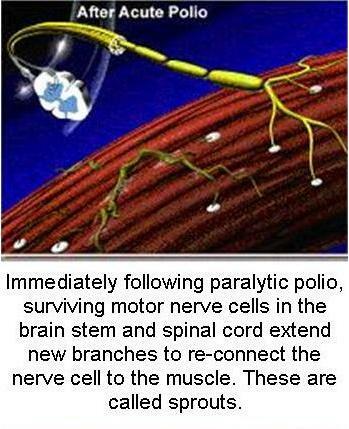 As both paralytic and non-paralytic polio survivors age, the neuronal ‘sprouts’ that supported muscle activity post-infection are degenerating as part of the ageing process, causing increased muscle weakness and atrophy, joint pain, and physical disability – even for those who appeared to have no residual disability at all. Many of these symptoms may be confused with premature ageing, especially if the person was unaware of – or is unable to acknowledge – having been infected with polio. Although there is currently no definitive data on the prevalence of LEoP/PPS in Australia, it is estimated that hundreds of thousands of individuals are either affected or at risk of developing the condition . Many of those affected by LEoP/PPS are over 50 years of age, reflecting the fact that polio was an uncommon infection in Australia by the early 1960s. However, migrants to Australia from countries where polio was eradicated later, or where polio continues to be endemic, means that there is cohort of younger polio survivors who contracted their infection outside of Australia more recently. LEoP/PPS is a condition that needs to be addressed now for Australia’s aging polio population, with diagnosis and management required for at least the next 20 years. Younger polio survivors will require services for many more years to come. use of a breathing machine at night to treat underventilation. Polio survivors can also help them themselves by ‘listening’ to their bodies and ‘pacing’ their activities. With time, survivors can learn when to stop before they become over fatigued. Many survivors report feeling better after adopting assistive devices and interspersing activities with brief rest periods. Polio conditions exist along with other diseases. Therefore, it is important not to get hung up on a diagnosis of the late effects of polio and/or post-polio syndrome. Polio survivors and their medical professionals are encouraged to work together to find the causes of any symptom and provide appropriate treatment (for example, medication for hypothyroidism, hypertension, diabetes, irritable bowel syndrome, and so on). An evaluation that too quickly determines that prior polio is the sole cause deprives survivors of potential treatments. Polio Australia, Managing Muscles and Mobility, 2014. Post-Polio Health International, Education Resource.